This non-smoking hotel provides accommodation in the heart of Amsterdam, a 5-minute walk from Leidse Square and the Flower Market. Free Wi-Fi is available throughout the hotel. Amsterdam Downtown hotel offers comfortable rooms with cable TV. Amsterdam Cribs Red Light offers smoker-friendly accommodation in the city centre of Amsterdam. Each room offers canal view. A flat-screen TV and DVD player, as well as an iPod docking station are offered. You will find a kettle in the room. Country Cottage is peacefully situated in the middle of a bird reserve and includes it’s own private jetty and a terrace with a barbecue. It offers free Wi-Fi and is only a 15-minute drive from Amsterdam. 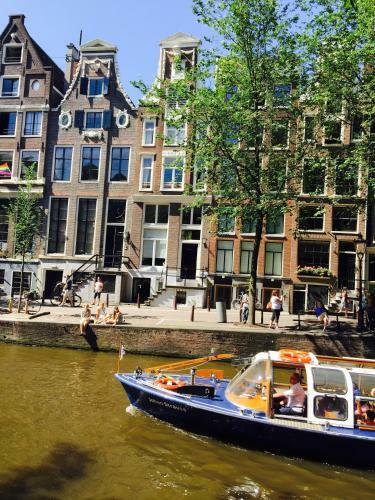 Located in the city centre and a 5-minute walk from Central Station, Amsterdam Cool Bed & Breakfast offers an accommodation overlooking the city. Shopping area Dam Square is 600 metres away. Situated in Amsterdam, this apartment is 200 metres from Carre Theatre. The unit is 800 metres from Dutch National Opera & Ballet. Free WiFi is featured throughout the property. Amsterdam City Bed & Breakfast is a self-catering accommodation located in Amsterdam. Free Wi-Fi access is available. The property is 1.5 km from Amsterdam Central Station and 800 m from Dam Square. Featuring free WiFi throughout the property, Amsterdam Centre Rooms offers accommodation in Amsterdam. Beurs van Berlage is 400 metres from Amsterdam Centre Rooms, while Dam Square is 400 metres from the property. Amsterdam Centre Romantic Hideaway is a self-catering accommodation located in the city centre of Amsterdam. Free WiFi access is available. The property is 300 metres from Beurs van Berlage and 300 metres from Dam Square. Amsterdam Centre Couples Penthouse offers accommodation in Amsterdam, 100 metres from Dutch National Opera & Ballet and 500 metres from Rembrandtplein. Amsterdam Centre Couples Penthouse boasts views of the city and is 700 metres from Carre Theatre.